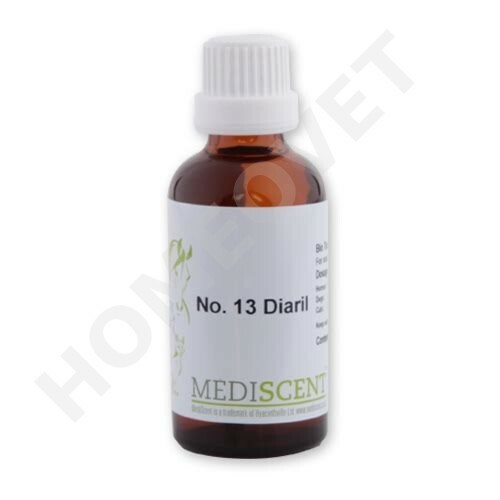 MediScent Diaril - adjunctive therapy for animals with digestive disorders and diarrhea. Probably the most common complaint received by veterinarians is that of diarrhea, it is not a disease, but a symptom, which can have different causes. Diarrhea in dogs or cat is manifested by soft to liquid faeces, which is more often than usual, partly offset uncontrollably. Reasons for this are usually a wrong diet, a change in diet, a food intolerance, bacterial or viral infections, internal parasites. More serious causes are chronic diseases of the intestinal tract or poisoning. Warning signs that diarrhea needs medical attention are fever, lethargy, loss of appetite, frequent vomiting, black, tarry stool, or stool with copious amounts of fresh blood (bright red), pain or diarrhea that lasts longer than 48 hours. Kittens, puppies and old and feeble animals need veterinary attention sooner! (Severe dehydration can lead to death). Podophyllum; Mayapple is useful when the stool has a yellow color (bile), and the patient is tormented by cramps and chills. Podophyllum is extracted from the rhizome of the Mayapple, and is mainly used against spouting diarrhea, the diarrhea often has a yellowish color, smells bad and is plentiful, the diarrhea is painless, stinks, is yellow-green, watery and / or slimy (with food particles and strong flatulence). China; China is an extract of the Peruvian tree Cinchona Pubescens; it is beneficial in great weakness and exhaustion, diarrhea, flatulence. China is also ssproving to be the right remedy if your pet has diarrhea, as a result of taking drugs such as antibiotics. The same agent can also help in painless, but tiring diarrhea, which is accompanied by flatulence. Aloe; acts in particular on colon and liver. The homeopathic medicine is given as an acute medication for gastrointestinal complaints. These include constipation, diarrhea and flatulence. Carbo Vegetabilis (Prepared from vegetable charcoal) is an excellent homeopathic remedy for treating indigestion, accompanied by plenty of gas. dilute extracts of; Mayapple, Aloe, Peruvian chinabark, Vegetable charcoal, Croton oil seed and Poison nut. Dog; If your dog shows only mild symptoms, it is often sufficient if you put your dog for 24 to 48 hours on a diet. Give MediScent Diaril and provide plenty of water or rice water (use good quality white rice; no ”minute” rice and no brown rice) also, give the dog plenty of rest. If after 24 hours of fasting, the symptoms have subsided, you can carefully feed your dog with small portions of food (either readymade dietary food or home-cooked diet) . If this is well tolerated by your dog, you can slowly convert him over several days back on his usual feed. Cat; Generally a readymade dietary food that protects the stomach and intestinal walls, is a good first measure. Horse; It is advisable to let clarify the cause of diarrhea by a veterinarian and than to treat accordingly!